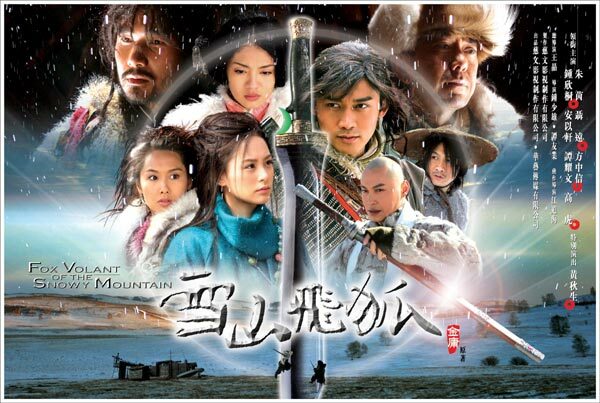 Summary : Fox Volant of the Snowy Mountain, based on the same titled swordplay novel by Jin Yong, stars handsome Mainland Chinese actor Nie Yuan (The Road) and Hong Kong's Athena Chu (A Chinese Odyssey) in an intriguing martial arts drama. Famous Hong Kong filmmaker Wong Jing, producer of this series, secured a helping hand from Andrew Lau (Infernal Affairs) to advise on directing. The series also pools together Gillian Chung of Twins, Alex Fong Chung Shun, Anthony Wong Chau Sang, Ady An, and Fan Bingbing to form a star-studded cast. The story focuses on young and talented swordsman Hu Fei (Nie Yuan), whose father (Anthony Wong) was killed while he was only a kid. In finding out the culprit, He Fei encounters a beautiful woman who is just as good in martial arts (Athena Chu), a Chinese medicine expert (Gillian Chung), and a young woman (Ady An) whose father Miao Renfeng (Alex Fong) is believed to be the murderer of Hu Fei's father. Will Hu Fei kill Miao Renfeng for revenge? The original novel never tells what happens in the final battle between the two - see if you can find some answers from the TV series! If you are a fan of martial arts series such as condor heroes and sword stained by Royal Blood, this is a must watch for you. "I watched this just because Gillian was in it, turns out that the series is wonderful, has so many famous actors and actresses. Gillian did a great job, she is so cute like OMG!! Nie Yuan also did a wonderful job portraying his character as well. Series has some good fighting scenes, storyline is good, Recommended for all!" "This is one of the best martial arts series I've seen. It has everything in it, non-stop action, great casts, cool music, stunning sets (some scenes were shot in real snowy mountains), addicting story, high-budgeted production. What more can you ask for?"